FORT WORTH, TX—In an effort to provide the most luxurious experience to their most preferred clientele, American Airlines announced Wednesday that they had installed two-way mirrors in their Admirals Club lounges so that members could enjoy the misery of the passengers in the gate waiting area. 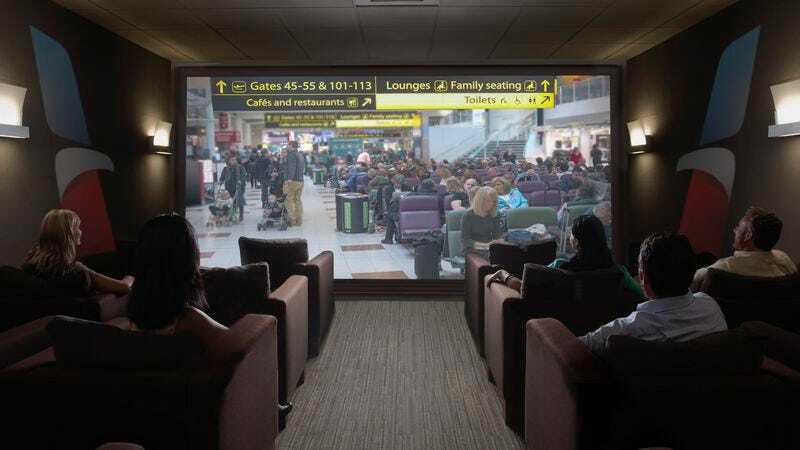 “These wall-length two-way mirrors allow our premium customers to relish the discomfort of the masses as they wait at cramped, overcrowded gates for their flights,” said spokeswoman Alexa Sheehan, explaining that gawking at ordinary passengers sitting on the dirty airport carpet while resting their backs on their carry-ons would make the Admirals Club reclining leather chairs that much more satisfying. “As always, our members can indulge in our complimentary cocktails and gourmet food options, but now with the added perk of watching stressed-out travelers who have only eaten french fries all day struggle to get comfortable in their neck pillows. And if they want a break from getting important work done at our Wi-Fi-enabled business center, they can just savor the herds of commoners wandering around in search of one of three available outlets to plug in their charger.” At press time, American was considering installing completely transparent glass after some Admirals Club members complained that people suffering at the gate couldn’t see firsthand all the perks they were missing out on.